On the way: Fr Mick Lowcock (back right) with members of the Mount Isa World Youth Day group ready to head off to Panama for WYD 2019. 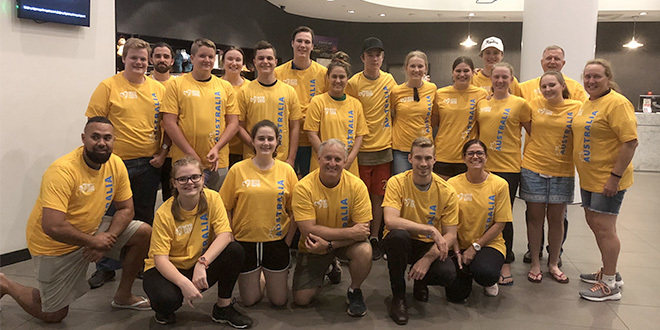 CATHOLICS across the world are preparing their final checks as they board their flights to Panama for World Youth Day 2019, and among them are 21 from the Mount Isa WYD group. While the majority of the group are Mount Isa parishioners, four are seminarians – two from Toowoomba and two from Townsville – as well as a mother-daughter pair of ex-Mount Isa residents living in Victoria. Of the Mount Isa core group, 10 are under 18 years old. Parish youth group co-ordinator James Coghlan said he hoped the young people had the chance to experience other cultures and see they weren’t alone in their spiritual journey. “We’re in Mount Isa, there’s 20,000 people who live here, it’s a small parish,” Mr Coghlan said. “When we travel away we see all these other kids and it wakes them up a bit to say, ‘Well it’s not just our little youth group, there’s others out there’. The event was also a chance to see “Papa Franco”, as they call the Pope in the parish, though Mr Coghlan said he had his binoculars just in case they can’t get that close. “It’s just to see the expression on the kids’ faces,” Mr Coghlan said. “Those who’ve been before say you can’t describe the feeling of seeing the pope, and the ones that haven’t been, they look at them like, you know a bit dubious – ‘he’s just a bloke’. “Having been older, like with politicians and so forth, the prime minister is just a person but in real life there’s just an atmosphere of those around them that you get swept up in. Mount Isa parish priest Fr Mick Lowcock said he was looking forward to seeing so many young people celebrating a shared faith. “All these people share the same faith and the one God, it certainly strengthens and reinforces for them how important it is,” he said. The Mount Isa WYD group will spend a week in Los Angeles with a parish there before heading down to Panama. While in LA they will meet with Fr Greg Boyle who works in gang intervention and rehabilitation through his project Homeboy Industries. The group will also spend a day at a parish school in LA. Fr Lowcock said it was a large effort raising the funds in order to get the group over there and thanked all those in the parish who helped. It was only by chance that it was even possible for the group to go. “The price originally with the designated people was too high,” Fr Lowcock said. The Mount Isa group will also join a New York group and travel with them. Mr Coghlan said the parish’s ability to send a WYD group this year and regularly in previous years was a testament to Fr Lowcock and the parish. He said many of the parents of the young people attending WYD told their children that when they went over there, they would appreciate how lucky they were. “That’s going to add to the experience, it will open their view of their world because for a lot of them Mount Isa is their world,” Mr Coghlan said. “We try and tell them there’s a big world out there that you can be a part of. “Our kids will be shy, but we’ve got enough adults that we’ll break down those barriers so that the kids start to mix. “They’ll be able then to talk about how they live. Mr Coghlan said he was a lot older than the young pilgrims but he still needed to make decisions about his own life and hoped WYD would provide that opportunity. “Being in the environment that you’re in in this type of event, it clears your mind and it allows the messages to come in,” he said.